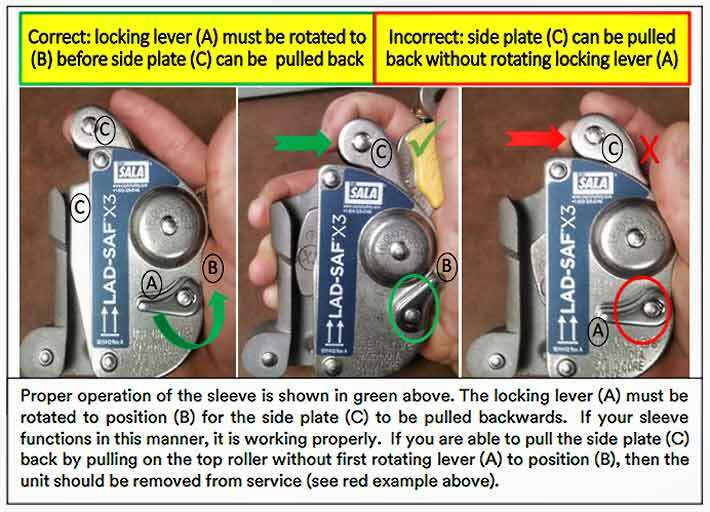 The Lad-Saf family of climbing sleeves are again in an unfavorable focus as 3M Fall Protection (formerly Capital Safety and DBI/Sala) has identified that a limited number of Lad-Saf X2/X3 sleeves were identified with the locking lever not working properly. In August, 3M issued a stop use and recall/replacement notice for their original Lad-Saf sleeve when incidents occurred involving a serious injury or death in the U.S. while tower climbers were using the sleeve, offering X2 and X3 sleeves as replacements. Today’s inspection notice said the X2 and X3 condition can allow the sleeve to disengage from the cable during use. The assembly error is believed to affect only a limited number of units and has been corrected, 3M said in a inspection notice statement, noting that there have been no accidents or injuries related to this issue. Those technicians and other end-users with the unit should immediately conduct an inspection (see above). This inspection is part of the pre-use inspection recommended for all X2 (#6160030) and X3 (#6160054) sleeves as described above. If you find an affected sleeve, 3M is requesting that you remove the sleeve from service and contact their customer service department at 800-328-6146 (prompt #2012) or email LADSAFNA@mmm.com to obtain a return authorization. Upon receipt of the affected sleeve, they will ship you a replacement sleeve within 24 hours at no charge. When 3M recalled their original Lad-Saf sleeves in August, the company didn’t have enough X2 and X3 sleeves to replace them and climbers were offered a free lanyard while they waited for a replacement. At a recent meeting of the Telecommunications Industry Association and representatives of OSHA in Washington DC, it was presented that DBI Sala has a 73% market share of installations of climbing systems. It is not know what percentages of sleeves they have.